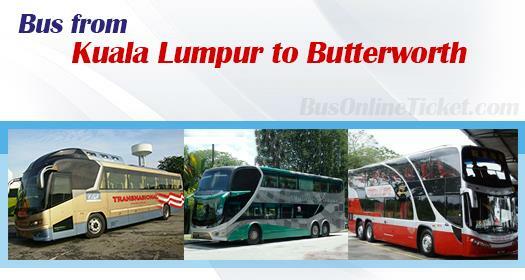 Bus from KL to Butterworth remains the favourite choice for travellers even with the strong challenge from ETS Train. With the ETS extension to Padang Besar, ETS train emerges to challenge traditional bus service from KL to Butterworth. With the more reliable and faster ETS train, many commuters change to take ETS train. However, ETS train service is constrained by limited schedule in a day. ETS train only supplies few departure services in the morning between 8-10 am and in the evening between 5 - 8 pm. Unless your travelling time fit into the train service time, you could not take train to Butterworth. Unlike the traditional express bus service, you can find a departure from TBS (Terminal Bersepadu Selatan) in every 30 minute or less. The frequent bus schedule offers departure time selection flexibility for commuters going to Butterworth. Apart from that, bus fare is about 50% cheaper than train fare. More importantly, the travel duration for both train and bus is about the same by taking about 4 hours from KL to Butterworth. Bus fare is very budget as compared to train fare. It costs about RM 28.80 to RM 38.00 from KL to Butterworth. Most coaches provide direct service to Butterworth with 1 stopover along the highway. The coaches later terminate at Penang Sentral, a newly built bus station in Butterworth. Passengers who are going to Georgetown can just have a short walk to jetty for boarding the ferry. Taking bus from KL to Butterworth is convenient, budget and comfortable. Now it is even more convenient by booking bus ticket online at BusOnlineTicket.com with instant confirmation. Credit card payment and internet banking options are available for online payment.